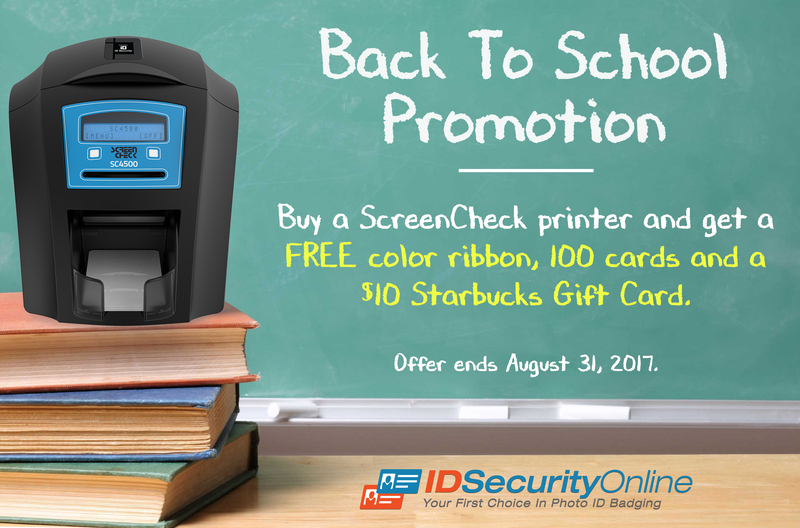 Exclusive US Distributor of ScreenCheck’s ID Card Printers offers a free color ribbon, 100 cards and a $10 Starbucks Gift Card with every ScreenCheck printer purchased through August 31st. IDSecurityOnline, a leading provider of ID card printers and photo ID systems, today announced that it is offering a back to school promotion on its line of ScreenCheck ID Card printers. This new promotion includes a free color ribbon, 100 cards and a $10 Starbucks Gift Card with every ScreenCheck printer purchased by August 31, 2017. IDSecurityOnline is the exclusive US distributor of ScreenCheck’s ID card printers. This unique line of printers was introduced to the marketplace in early 2017 and organizations of all industries and sizes are reaping the benefits of having the right ID Card solution at their fingertips for any application. The SC2500 is an entry-level ID Card printer that organizations can use as a compact, portable, budget-friendly solution. The SC4500 is another great option for organizations looking for an affordable and adaptable printing solution. On the higher end, the SC6500 and SC7500 are durable and robust options that were designed for highly secure ID card printing. To benefit from this offer, visit http://www.IDSecurityOnline.com and use promo code BACKTOSCHOOL. Offer ends August 31, 2017.